Report by Badal Tah; Rayagada, August 9: Forest Rights Act (FRA) promulgated during year 2006 for Schedule Tribes and Traditional Forest Dwellers grants legal recognition to the rights of traditional forest dwelling communities, partially correcting the injustice caused by the forest laws and makes a beginning towards giving communities and the public a voice in forest and wildlife conservation. Entire Rayagada district comes under Schedule-V and is covered under FRA. According to the statistics of achievement of implementation of the FRA in Rayagada, there are 2,469 villages in the district where FRCs have been constituted. When issue of land comes to the forefront, tribals give less priority to issues like health, education, employment and Government entitlements, etc. Several thousands of forest land has been distributed under this Act. But one of the major challenges of the forest department is to delineate the boundary of the areas of the beneficiary given through Forest Right Act and monitor the development projects taken on them. Fortunately enough to tackle this challenge, Forest Deptt is in the process of using a massive Geospatial & IT initiative. At present it monitors forest patrol performed by its ground force using mobile devices and specialized PDAs (Personal Digital Assistance). All these data captured by the devices are geospatially validated by an enterprise class Geographical Information Systems(GIS) server and used to monitor the forest health. GIS is a suite of software tools for mapping and analyzing data which is georeferenced (assigned a specific location on the surface of the Earth, otherwise known as geospatial data). Similarly there are host of other mobile and PDA applications like Incident Reporting, Asset Mapping, Forest Fire Monitoring, Forest Survey, Inspection of Departmental work, Survey of Forest Right Titles of the Tribals, etc . All this mobile base monitoring is operational in most inaccessible areas where there is no internet connectivity also. The application is so designed by the Forest Department that only one needs internet connection at the time of data sync to the server. Even Forest Department monitors the attendance of the staffs in remote locations and the monitoring of the all departmental works are undertaken by the ground force and the data is utilized by the administrations at Division, Circle and State level. This programme caters to the vision of the State Government’s the “3Ts” i.e. Technology, Transparency and Teamwork. This programme is highly popular among the ground staffs as it gives a window to showcase their day to day performance in remote areas and also to permanently document their works for future verifications. The level of adaption of this technology is very encouraging in Rayagada Forest Division. The Forest Headquarter oversees response of ground force in control of forest fire incidence. The fire incidence message instantly sent to the mobile device of the ground force for immediate control and entire process is automated by the GIS servers of Forest Department. It is the only department which is using mobile devices for monitoring different forestry operations at ground level. It has now become easier through launch of Forestry Mobile App for FRASurvey at Sadbhabana Hall of Rayagada Collectorate. This will help both the Revenue and Forest Department for identification and demarcation of the beneficiary’s land through mobile in an easy and timely manner and through GIS Technology. Keeping undivided Koraput as focus of Tribal Development , FRA App was launched at Rayagada which will be utilized in a big way for People to Save Forest and Environment. 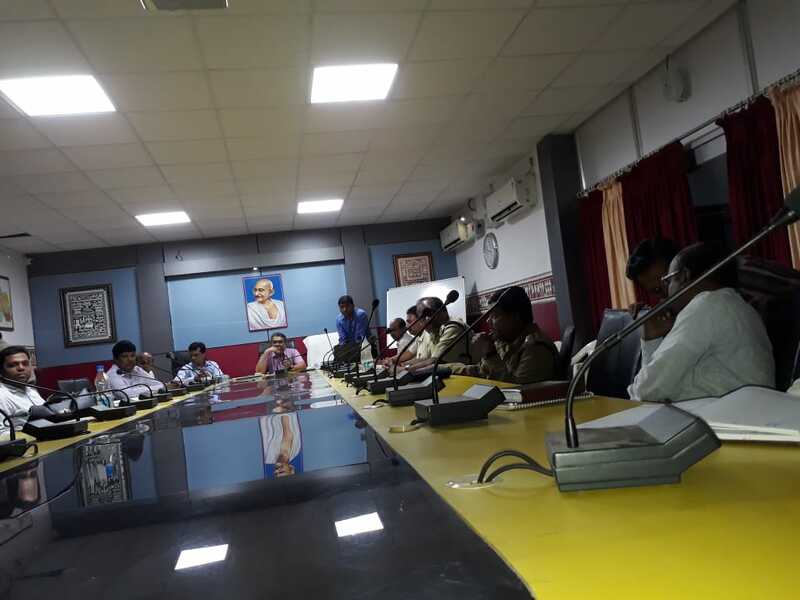 As the Sadbhabana Hall was not connected with wi-fi, Sri P K Mallick, IFS, Chief Conservator of Forests(GIS & IT), Forest Headquarters, Bhubaneswar, who earlier officiated as DFO, Rayagada, inaugurated the workshop, expressed his displeasure as it was difficult for him in showcasing the use of technology. The participants then had to move to the NIC room and stood to experience the technology in a desktop monitor. Sri Debarchan Behera, DFO, Rayagada, Sri P K Bhatra, ACF, Sri Alekh Samal, ACF, Sri Prabir Nayak, Sub-collector, Rayagada, Sri Prabhakar Senapati, Range Officer, Rayagada, Sri Anil Kumar Ray, Range Officer, Muniguda and several Tahsildars and Welfare Extension Officers of the district participated in the workshop. “This technology will certainly pave the way towards efficiency, transparency of the department which will ultimately build trust among the tribals and people in general”, said Sri Anil Ray.